The Musical Offering (German: Musikalisches Opfer or Das Musikalische Opfer), BWV 1079, is a collection of keyboard canons and fugues and other pieces of music by Johann Sebastian Bach, all based on a single musical theme given to him by Frederick the Great (Frederick II of Prussia), to whom they are dedicated. The Ricercar a 6, a six-voice fugue which is regarded as the highpoint of the entire work, was put forward by the musicologist Charles Rosen as the most significant piano composition in history (partly because it is one of the first). This ricercar is also occasionally called the Prussian Fugue, a name used by Bach himself. The composition features in the opening section of Douglas Hofstadter's Pulitzer Prize winning book Gödel, Escher, Bach (1979). 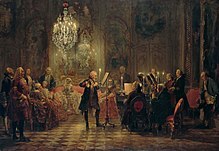 The Flute Concert of Sanssouci by Adolph Menzel, 1852, depicts Frederick playing the flute in his music room, with C. P. E. Bach accompanying him on a harpsichord-shaped piano by Gottfried Silbermann. Two months after the meeting, Bach published a set of pieces based on this theme which we now know as The Musical Offering. Bach inscribed the piece "Regis Iussu Cantio Et Reliqua Canonica Arte Resoluta" (the theme given by the king, with additions, resolved in the canonic style), the first letters of which spell out the word ricercar, a well-known genre of the time. Humphrey F. Sassoon has compared the theme issued by Frederick II to the theme of an A minor fugue (HWV 609) by George Frideric Handel, published in Six fugues or voluntarys for organ or harpsichord. Sassoon notes that "Handel's theme is much shorter than the King's, but its musical 'architecture' is uncannily similar: jumps followed by a descending chromatic scale." He also elaborates on their additional similarities, which led Sassoon to suggest that Bach used Handel's A minor fugue as a structural model or guide for the Musical Offering's Ricercar a 6, and that its musical concepts may also have influenced Bach's development of the Ricercar a 3. Nevertheless, the Ricercar a 6 is longer and incomparably more complex than Handel's fugue. Arnold Schoenberg, in his 1950 essay on Bach, suggested that the Thema Regium was created by Bach's son, Carl Phillip Emanuel, on the orders of the King, as a well-prepared trap to embarrass J S Bach. Canon a 2 "Quaerendo invenietis"
Apart from the trio sonata, which is written for flute, violin and basso continuo, the pieces have few indications of which instruments are meant to play them, although there is now significant support for the idea that they are for solo keyboard, like most of Bach's other published works. The ricercars and canons have been realised in various ways. The ricercars are more frequently performed on keyboard than the canons, which are often played by an ensemble of chamber musicians, with instrumentation comparable to that of the trio sonata. As the printed version gives the impression of being organised for convenient page turning when sight-playing the score, the order of the pieces intended by Bach (if there was an intended order) remains uncertain, although it is customary to open the collection with the Ricercar a 3, and play the trio sonata toward the end. The Canones super Thema Regium are also usually played together. Some of the canons of The Musical Offering are represented in the original score by no more than a short monodic melody of a few measures, with a more or less enigmatic inscription in Latin above the melody. These compositions are called the riddle fugues (or sometimes, more appropriately, the riddle canons). The performer(s) is/are supposed to interpret the music as a multi-part piece (a piece with several intertwining melodies), while solving the "riddle". Some of these riddles have been explained to have more than one possible "solution", although nowadays most printed editions of the score give a single, more or less "standard" solution of the riddle, so that interpreters can just play, without having to worry about the Latin, or the riddle. One of these riddle canons, "in augmentationem" (i.e. augmentation, the length of the notes gets longer), is inscribed "Notulis crescentibus crescat Fortuna Regis" (may the fortunes of the king increase like the length of the notes), while a modulating canon which ends a tone higher than it starts is inscribed "Ascendenteque Modulatione ascendat Gloria Regis" (as the modulation rises, so may the King's glory). The canon per tonos (endlessly rising canon) pits a variant of the king’s theme against a two-voice canon at the fifth. However, it modulates and finishes one whole tone higher than it started out at. It thus has no final cadence. Among the theories about external sources of influence, Michael Marissen’s draws attention to the possibility of theological connotations. Marissen sees an incongruity between the official dedication to Frederick the Great and the effect of the music, which is often melancholy, even mournful. The trio sonata is a contrapuntal sonata da chiesa, whose style was at odds with Frederick’s secular tastes. The inscription Quaerendo invenietis, found over Canon No. 9, alludes to the Sermon on the Mount (“Seek and ye shall find”, Matthew 7:7, Luke 11:9). The main title, Opfer (“offering”), makes it possible for the cycle to be viewed as an Offertory in the religious sense of the word. Marissen also points out that, canonic procedures often evoking the rigorous demands of the Mosaic Law, the ten canons likely allude to the Ten Commandments. Marissen believes that Bach was trying to evangelize Frederick the Great, pointing him to the demands of the Mosaic Law. In a recent study Zoltán Göncz has pointed out, the authorial injunction to seek (Quaerendo invenietis) does not only relate to the riddle canons but to the six-part ricercar as well, whose archaic title also means to seek. There are several Biblical citations hidden in this movement, and their discovery is made especially difficult by various compositional maneuvers. The unique formal structure of the fugue provides a clue: certain anomalies and apparent inconsistencies point to external, nonmusical influences. Among Bach's duties during his tenure at Leipzig (1723–50), was teaching Latin. Ursula Kirkendale argued for a close connection with the twelve-volume rhetorical manual Institutio Oratoria of the Roman orator Quintilian, whom Frederick the Great admired. Philologist and Rector of the Leipzig Thomasschule, Johann Matthias Gesner, for whom Bach composed a cantata in 1729, published a substantial Quintilian edition with a long footnote in Bach's honor. The "thema regium" appears as the theme for the first and last movements of Sonata No. 7 in D minor by Friedrich Wilhelm Rust, written in about 1788, and also as the theme for elaborate variations by Giovanni Paisiello in his "Les Adieux de la Grande Duchesse de Russies," written in about 1784, upon his departure from the court of Catherine the Great. Webern's arrangement was dedicated to the BBC music producer and conductor Edward Clark. Another version of the Ricercare a 6 voci was published in 1942 by C. F. Peters in an arrangement for organ by the musicologist Hermann Keller, then based in Stuttgart. Igor Markevitch produced a realization for three orchestral groups and, for the sonata movements, solo quartet (violin, flute, cello, and harpsichord), written in 1949-50. Isang Yun composed Königliches Thema for Solo Violin, a passacaglia on the Thema Regium with Asian and Twelve-tone influences, written in 1970. Bart Berman composed three new canons on the Royal Theme of The Musical Offering, which were published in 1978 as a special holiday supplement to the Dutch music journal Mens & Melodie (publisher: Het Spectrum). Sofia Gubaidulina used the Royal Theme of The Musical Offering in her violin concerto Offertorium (1980). Orchestrated in an arrangement similar to Webern's, the theme is deconstructed note by note through a series of variations and reconstructed as a Russian Orthodox hymn. Leslie Howard produced a new realisation of The Musical Offering, which he orchestrated and conducted in Finland in 1990. The organist Jean Guillou transcribed the entire work for organ in 2005. ^ Rosen, Charles (18 April 1999). "Best Piano Composition; Six Parts Genius". The New York Times. ^ David, Hans T.; Mendel, Arthur; Wolff, Christoph (1999). The New Bach Reader. W. W. Norton & Company. p. 224. ISBN 0-393-31956-3. ^ Gaines, James R. (2006). Evening in the Palace of Reason: Bach meets Frederick the Great in the Age of Enlightenment. Harper Perennial. pp. 9–11. ISBN 978-0-00-715392-3. ^ Schoenberg, Arnold; Stein, Leonard; Black, Leo. Style and idea : selected writings of Arnold Schoenberg. Berkeley: University of California Press. p. 394. ISBN 0520052862. OCLC 12105620. ^ Michael Marissen (1995). Daniel R. Melamed, ed. "The theological character of J. S. Bach’s Musical Offering." in Bach Studies 2. Cambridge University Press. pp. 85–106. ISBN 978-0-521-47067-4. ^ Kirkendale, Ursula (Spring 1980). "The Source for Bach's Musical Offering: The Musical Offering of Quintilian". Journal of the American Musicological Society. 33 (1). pp. 99–141. doi:10.2307/831204. ISSN 0003-0139. "The Musical Offering: A Musical Pedagogical Workshop by J.S. Bach, or The Musical Geometry of Bach's Puzzle Canons" [English], Schillerinstituttet [Danish]. Phillips, Tony (March 1, 1999). Feature Column: "Math and the Musical Offering", What's New in Mathematics: American Mathematical Society. "Sound Recordings Library: Ars Rediviva – Milan Munclinger: J.S.Bach: The Art of Fugue, Contrapunctus VIII. ": FrantišekSláma.com. "Johann Sebastian Bach (1685–1750), L'Offrande musicale – 'Musical Offering', 'Musikalisches Opfer' BWV 1079", ClassicalÀlacarte.com.